MotionArtist is dedicated composition software for creating animated comics, otherwise known as Motion Comics. That is, rather than create fully animated cartoons, it allows you to take static cartoon panels and add movement and audio to create a more engaging experience. The type of Motion Comic MotionArtist can produce falls somewhere between reading a comic and watching a cartoon but generally, feels more like reading a very cool comic than watching a severely limited animated cartoon. MotionArtist has dedicated tools for creating comic book panels with their own self contained animations. It also makes it simple to animate across multiple panels and even animate the panels themselves. 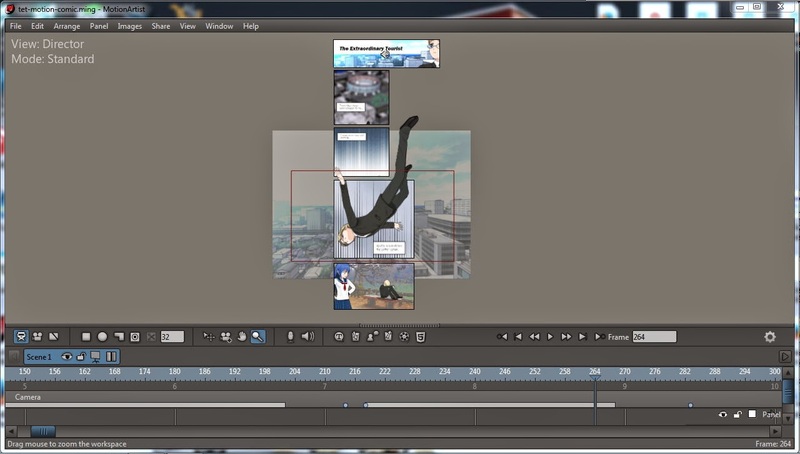 Everything is done using key frames displayed on your comic's timeline with individual panels containing their own timelines to control the animation contained within it. There are three modes which you switch between that does take some getting used to. Director mode lets you edit the entire production as a whole across multiple scenes (a scene could be defined as each page of your comic if you wanted to maintain a traditional comic format). Camera Mode is specifically for key framing how the 'camera' moves throughout your comic. 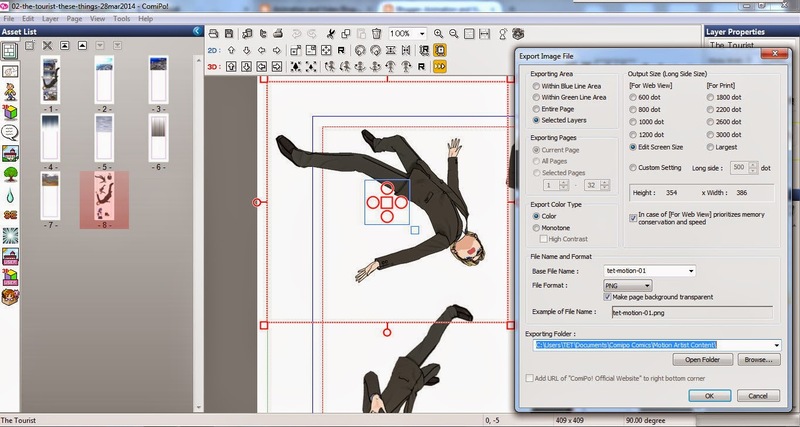 Panel mode lets you edit the animation within each panel. As my first project I thought, what better way to test MotionArtist than to see if I could turn my ComiPo! comic, that I created when I reviewed that software, into a motion comic. As a reminder you can see a small version of my comic on the right. You'll need to click the image if you want to view the full size version. You'll notice it's ideal motion comic material as the majority of the comic is the main character falling. Below is the motion comic version which I think probably goes a little too quick to read all the speech balloons easily but you get the idea (you may need to watch it full screen). It should also be noted that you can output animations as either a video file (as I have) or you can embed them into webpages in HTML5 format. This allows added interactivity such as buttons for the user to click to move to the next page or panel. MotionArtist will accept a number of different image file formats. If you have photoshop then you can import native .PSD files and retain the layer order. Potentially saving a lot of time as you could create your pages in Photoshop then import them to MotionArtist to add all the animation elements. ComiPo! isn't photoshop but fortunately it can export transparent .PNG files of any object. In order to do that I had to break down my comic into its individual components - excluding panel frames and text balloons - and import each one individually as a .PNG file. Yes it was a little time consuming but certainly worth the results. Enlarge to see the settings I used. For all my backgrounds I exported the full background image and not just the cropped area you could see in each panel. Once you've exported all your components you just import them into either your panels or scenes in MotionArtist as needed. Below is a screen shot of my comic assembled in MotionArtist. You'll notice I've followed the same basic layout as the ComiPo! comic. As this is frame 264 of the animation, which focuses on the largest falling character image (indicated by the red box outline that represents the camera's view), some of the characters in the earlier panels are missing, having already played through their animations. You may also notice from the image that my motion comic only has one scene. If I were to add a second scene I would then have the option to add transitions between the scenes. It's really hard to describe how you actually put together a motion comic in MotionArtist. The basics are that everything is divided into scenes and within scenes you have panels. Movement is achieved by placing an object at its starting point, scrubbing the timeline forward however long you want a movement to take, then placing the object at a new location and/or angle. As you do this you'll see a motion path is created with dots indicating a key frame (or stopping point). You can key frame panels and objects to fade in or out. Objects can be attached to the camera so they move wherever you move the camera (as I did with my comic's background image). Panels that you've already created animation inside can be literally split in two (or more) sections and the animation will still work across the sections. You can even make the panels themselves move. There are also plenty of options for speech balloons and adding text. I used none of my original speech balloons from ComiPo!, instead creating these in MotionArtist. I believe you can make the camera automatically follow your sequence of panels but I found you get more interesting results if you key frame the camera movement yourself. There is also a great a parallax feature that automatically gives your panels a 3D like effect. I did use it my comic but you can see a better example in the Introductory video below. MotionArtist can also import video and audio files, though in the current version this isn't obvious how to do. I didn't come across anything in the video tutorials demonstrating it. Everything is imported using the same import button, just above the timeline. There's nothing to ask you what kind of file you're planning to import and no list of supported formats to give you a clue as to what you can import in the resulting dialogue box. This is one piece of software that it pays to look through the PDF manual to fill in the gaps of what the video tutorials don't cover. MotionArtist is desktop publishing software for MotionComics. You create all your individual components elsewhere including PhotoShop, Anime Studio, Manga Studio, and any other software that at least can create transparent .PNG files (such as ComiPo! ), then bring it all together in MotionArtist. With the current explosion in low cost animated video creation tools you could use any of them to similar effect. 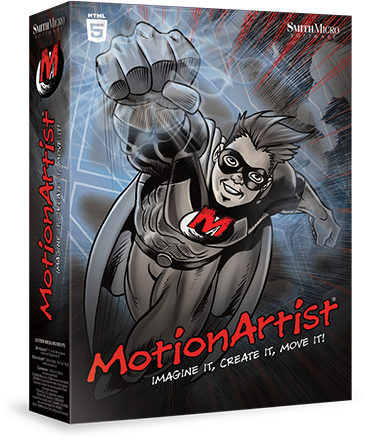 However, if all you want to do is produce motion comics, then MotionArtist has the features that will help you produce a motion comic quicker than anything else. It's certainly a good companion piece for ComiPo! if you want to produce more dynamic content whilst still keeping your feet in comic creation rather than animated cartoons. MotionArtist could also be used for creating more dynamic general presentations too. There's no reason to just stick to creating comics. This could well be an alternative to some of those business animation presentation tools that have been released lately. All up it took me a couple of days to learn the basics and produce my first motion comic. That's not bad for such powerful software that could be a lot of fun in long run. I like the idea of combining it with ComiPo! because personally I don't read comics but I will watch an animation. That's where MotionArtist can potentially give your work a new audience who are more accustomed to watching video. Really cool idea! I'm not sure what differentiates the software from other animators, though. But exporting the individual parts from Comipo isn't really something that I considered. The biggest issue right now is that the Comipo resources don't look very good. Really disappointed that more premium items haven't come out. MotionArtist is specialized for this kind of work. Sure you could use other animation tools but if motion comics is all you want to do then MotionArtist is worth looking at because it has tools specific to that style of presentation that will make the job much faster and easier.